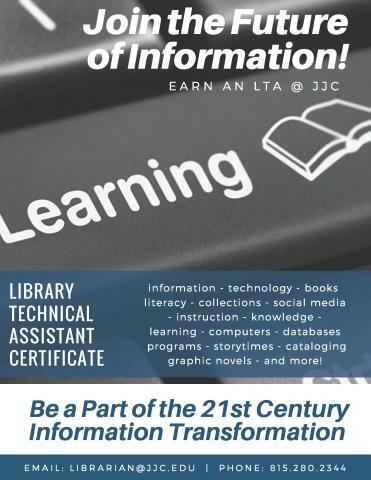 2018 Spring Semester registration is now open for new and continuing Library Technical Assistant students at Joliet Junior College. If you are interested in starting the program, please note that you do not have to take these courses in sequence, however there is a placement requirement for English skills. The Library is in the Campus Center, Building A , on the 2nd Floor. The College is located at 1215 Houbolt Road Joliet, IL 60431. Do you have questions about the LTA certificate? Please contact Michelle Y. Roubal at 815.280.2350 or mroubal@jjc.edu for more information.